Cook butternut squash ravioli according to box instructions. Drain. 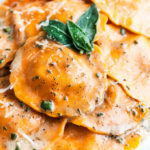 Make the sauce: While cooking ravioli, melt butter in a large, preferably light colored, skillet over medium heat, stirring frequently and swirling the pot to ensure even cooking. * After about 5 minutes, the butter will start to foam up. Add the minced sage and continuing stirring and swirling the pot. Golden brown flecks, milk solids, should start to form on the bottom of the pan. Continue stirring to make sure these don’t stick and burn. When the butter is nutty in aroma and golden brown in color with plenty of flecks, about 2 more minutes, remove from heat and cool for 2 minutes. Slowly pour the chicken broth and whisk frequently, as the butter will foam up, until completely incorporated. Repeat this process with the cream. Be careful of splatter! Add the lemon juice and parmesan cheese, whisking until completely combined. Add salt and pepper to taste. Stir in the cooked ravioli. Garnish with extra parmesan cheese and fried sage if desired*. If desired for garnish, add a few fresh sage leaves to the butter and cook 1-2 minutes, until crispy but not browned. Using a slotted spoon, remove from the pan to a paper towel lined plate. Sprinkle with a pinch of coarse salt and set aside. This sauce will appear a little on the thin side and thickens up as it cools.